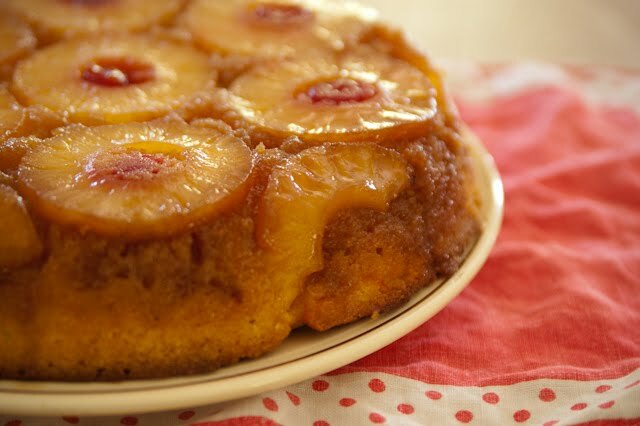 I love a pineapple upside down cake, but alas I can't eat pineapples anymore. So I was pleased when I tried a pear upside down cake and it was just as yummy! Your cakes always seem to turn out so well! What a lovely project, to work through a collection of recipes! Pineapple upside down cake..just perfect.. LOVE them.. And yours looks soooo yummy..
An Easter tradition in our home. I went to make it in a skIllet this year, but my cast iron is way small! Wondering...what size did you use? Ten inch, I think. Fiona, I also like pie cherries, or sliced apples, or blue or blackberries. I loved this when my sweet Mum made it during my growing up year - it was 'just' a weeknight cake - right up there with Lazy Daisy Cake, Queen Elizabeth Cake, Gingerbread with Citrus Fluff and Spice Bars. It wasn't a company cake like Silver Lady Cake, Morning Glory Cake, Hummingbird Cake, Angel Food Cake, Strawberry Flan Cake or Black Forest Cake, but it was just for family, so it was simple, according to Mum. Can you tell I have lots of great cakes in my sweet memories? When my dad was diagnoses with diabetes she switched to pies and now she is the queen of low sugar fruit pies - I think she can make them in her sleep. My husband would love this cake.